CAPS LOCK is a either loved or hated, but regardless of the variety of opinions on capitalizing every single letter typed out, it can sometimes be just outright necessary. If you find yourself needing to use caps lock on an iPhone, iPad, or iPod touch, it’s really easy to turn on and turn off, and you can do it from just about anywhere. This applies to all versions of iOS on all devices, get your iPhone or iPad and try it yourself. Note that the appearance of caps lock is slightly different depending on the version of iOS itself. Here’s what this looks like in older versions of iOS, where the CAPS LOCK key is signified with a blue highlight color. 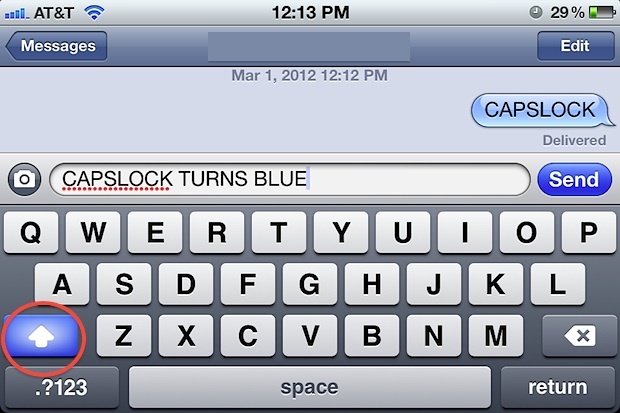 You will know caps lock is enabled or disabled because the shift key turns blue when it’s on, providing an obvious indicator that everything typed is about to appear in ALL CAPS. When it’s off, the shift key will be the normal grey color again, which is the default setting. Caps Lock is actually a fairly new feature to be enabled by default in iOS. Prior to newer versions of iOS (5+), users had to tap through to Settings > General > Keyboard and then manually enable the ability to turn on caps lock this way. Now this process is reversed, with the double-tap feature enabled by default, providing access to the feature without adjusting a system setting. Nonetheless if you hate caps lock or find yourself accidentally enabling it, you can still disable it completely by flipping the “OFF” switch in the aforementioned Keyboard settings. When it’s disabled, double-tapping the Shift key has no effect outside of the ordinary, instead toggling between capping the next typed letter or not, and stopping there. Now the next time you need to lock caps for some reason, whether it’s because you feel the need to virtually yell from iOS, want to type out a really ridiculous looking email, or a legitimate work reason, you can do so. What makes this a LOT less useful is that whenever you go to the numbers and symbols keyboards, the caps lock gets released. So you can’t really use it to enter long serial numbers, VIN numbers, etc. that are mixed caps letters and numbers. I wish Apple would fix this. Me too. Totally. I don’t hardly ever use caps lock for typing regular words (who would unless you’re really shouty), but putting in alphanumeric codes, number plates, and all those kinds of things when I DO want it is when it doesn’t function properly. Anyone know if it works on 3rd party keyboards or they system itself hampers that?